Sold by Cloudtail India (4.5 out of 5 | 73,259 ratings) and Fulfilled by Amazon. Gift-wrap available. 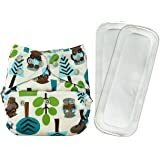 One size reusable diaper cover (adjusts small-medium-large in the same diaper) with one natural bamboo insert, change only the insert every 2-5 hrs depending on the urination pattern and keep the same diaper cover for a second use for the day, after wiping the inner portion. 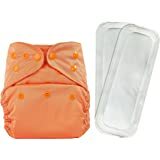 Though the one size diaper last till the baby crosses 3 years of age, the Bumberry diaper cover is preferred by mothers mostly as an excellent day time diapering option for babies under 1 year of age. 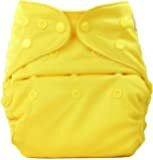 Bumberry natural bamboo insert is also preferred among mothers for babies with high skin sensitivity and therefore allergic to disposable diapers. Though the diaper cover can be used for longer hours with multiple insert changes, we recommend to limit the use of maximum 6 hours as per APA guidelines. 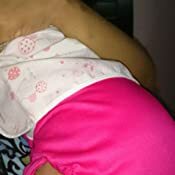 The Bumberry wet free microfiber insert is also an excellent option to be used along with Bumberry diaper cover as the insert has an additional layer of wetness protection that keeps the baby's bum dry, offering longer diapering time. I beg to differ with the reviewer "abcde" The diapers are working as they are expected to be. 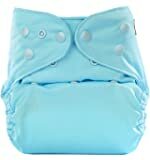 I have been using these diapers with the inserts for the last 5-6 months and I have not found any problems with them. 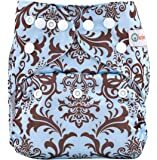 I have purchased 4 Nos of these diapers in various colors for my baby and it works well. At certain times you find leakages from the side but it can be prevented with proper buttoning of the diaper. 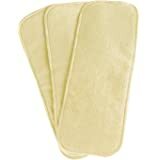 Make sure you order Bamboo Cotton Inserts as they are natural and better than the microfiber ones. 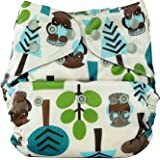 This is a great diaper to start your cloth diapering journey with. We have used for our baby from 2 months of age until he was toilet trained. Worth the money. 5.0 out of 5 starsDiaper cover is good but not the insert! The diaper cover is very very useful.. but the insert is not good.. low absorbency. 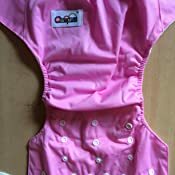 Instead of that you can buy bumberry micro fiber insert.. it lasts for 2 to 3 hours for my 5 months old baby. The cover and insert is good. But this will not perfectly fit a 6 month old baby. It is so big and the material is such that it cannot be used in summer. I just used it once and kept aside. Not worth buying if your baby is less that a year. 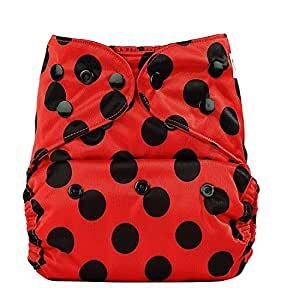 The diaper insert that comes with this is awful, does not absorb anything and keeps the baby wet. Prefer to buy the one without the insert or buy the one with high absorbing capacity (5 layer bamboo). Poor customer service. Wide crotch. No perfect fit.